During our visit at the Museum of Fine Arts, we explored numerous ancient cultures and the many artifacts that were found during their respected time periods. As individual students slowly branched off into separate time rooms, I was struck in awe by two pieces from two very different time periods. The first artifact is titled: Funerary stela of Iret-Hor-sekheru. Year created - 767 B.C. This piece was interesting to me in numerous ways. Having this piece being constructed on limestone was interesting to me because of the softness of the actual stone. Limestone is subjected to easily being chipped and broken so when you look at the details of the hieroglyphics and the picture depicting the scene is something quite beautiful and breathtaking. As you can see in the provided picture, the attention to detail is something that was of great importance in Egyptian culture, this can also be seen in their burial process as everything had to be kept ‘fresh’ for the afterlife. Egyptians had a wide variety of stone and having limestone available to the masses was mainly used for relief art (carving out characters.) One could assume that the type of stone had a correlation to the event being depicted. For example, this particular artifact belonged to a physician asking the Gods to have his body go to the heavens and his soul to the stars were it would never set. One could assume that because of his role in society, he would receive a higher quality stone. This is yet another interesting piece has it brings in royalty to the picture. 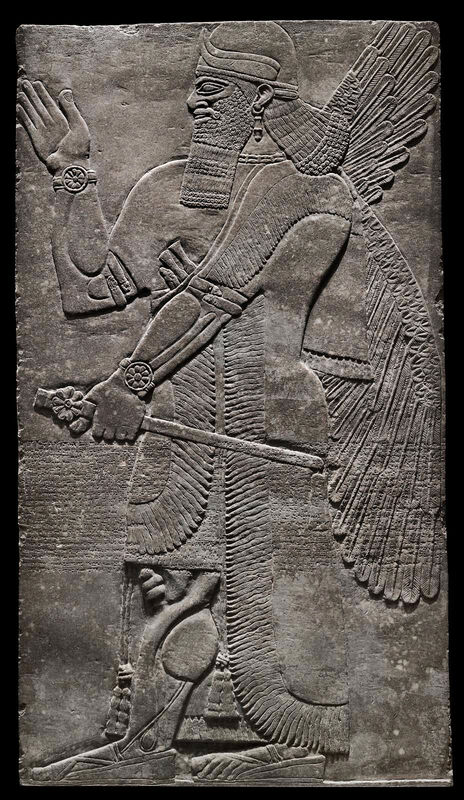 Although the king isn’t the one carved in this artifact, it was normally presented within royal palaces and were closely associated with the Assyrian Empire of 883 B.C. The character that is sculpted is called a ‘genii’ or a winged man that have numerous functions to the palace. The one that we are looking at, is holding a mace, this can best be symbolized as a divine reasoning and protectiveness over the lands. While there are numerous depictions of these genii, they all have religious symbolic reasonings of being hung in the palace. Something of this nature, would not normally be found in every household. Just the large size of the artifact can tell us that this was for royalty and not the common folk. There is great attention to detail, much like the stela artifact, which can tell numerous stories. The inscription found on the actual piece has faint lines underneath which shows the delicate craft of the artist. The inscriptions tell a story of war, hunting, and religious scenes. These relief sculptures can almost be seen as chapters of a great war novel, as once placed in a row, can show the victories and founding of the new capital. Standing at near 7.5 feet, these sculptures dominated the space and just oozed with success and power. This was without a doubt meant for a king or emperor. Although these pieces were commissioned in different time eras, they do share similar qualities and aspects. Both include religious aspects in terms of their main messages. While the Stela is certainly more of a personal call to the Gods, it does in a detail orientated fashion. Much like the Stela, the winged genii tells religious stories that will be passed down for generations to come. These religious aspects can be seen not only in the text, but the wings that are engraved in both of the artifacts. Wings obviously have a religious conotation as they are often thought of being messengers from the Gods above. These are both very visual artifacts that are able to tell a story in that visual sense. Another similarity these artifacts share is the detailed pictures. Hieroglyphics are clearly a visual mode of communication but the actual engraving of the scene between father, mother, and son allows for us to have a better understanding of that moment in time. We can almost get a glimpse of facial expressions. With the relief of the winged genii, the visual aspect comes with the small details of the wings, mace, and facial features. This was a piece that needed to seem powerful and the more detail, the better. The differences also lie within the text. 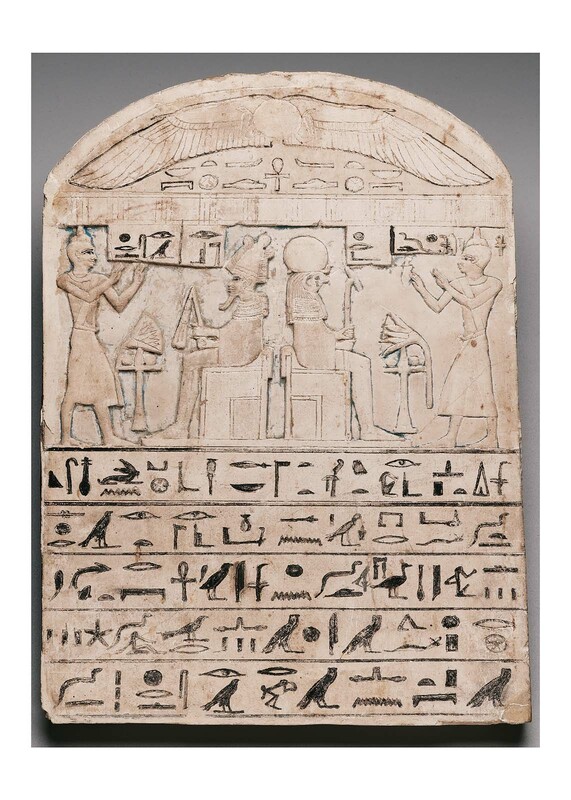 The Egyptian Stela is a very intimate artifact. We are outsiders looking into a very personal moment between the doctor and his conversation with the Gods. This is a mans last wish and we able to get a quick glance at how it unfolds. I think this text was most likely found in a collection of other Stelas with the main purpose of a memorial, much like how we have in our modern day.